It’s always difficult to secure high-value inventory in the warehouse, and it’s even harder when the load resides in pallet racks, which are larger, have a conventionally open design, and more difficult to secure than inventory that sits on shelves or in carousels or within tool cribs. Pallet rack loads can be palletized or stacked on decking, but either way they are more “open” than other types of inventory. What are your alternatives? Use upper bays to keep it out of reach. Store it in a separate area/facility. Utilize solid-side rack security enclosures. This isn’t a particularly effective method for a number of reasons, but it will deter people on the ground from taking stock off the racks. They would need to use a forklift or rolling ladder to gain access, which can be an impediment. It’s effective vs. outsiders or warehouse visitors who might walk down the aisle, but your employees would still need to pick from these locations, so pilferage would still be an issue. To do this, designate a high security aisle for those items more prone to theft. This aisle can be placed closer to activity, or near supervisors’ area. Ideally, you could utilize a single-deep row of rack against a wall, closing it off from that direction. You could control access either with folding gates or by banning unauthorized employees or visitors from it. The issue can be accessibility. This is a security measure that will help in some circumstances, but would be fairly easily to defeat. You can fence off the lowest level of a rack aisle, making it difficult for people to enter except through the front of the aisle, which can be gated. 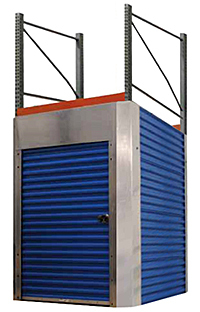 This option is for those who have a sub-room or separate building where this inventory can be stored away from general inventory. A good example we have seen is tobacco products in grocery distribution, which is highly valuable to thieves and pilferers, but relatively compact and easy to store. 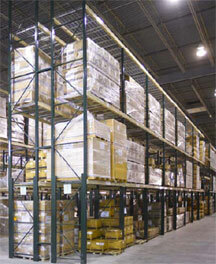 The active inventory is kept in a security cage while bulk inventory is segmented to a different room. If you don’t have the luxury of a separate area, then you have to take other measures. What if you must guard a single bay, or just a couple? There are a couple of options that allow you to secure a bay or two. How do they stack up vs. each other? These cages are a good alternative when you want to close a rack bay, or even a series of them off to unauthorized personnel. If the rack is against a wall in a single row, you could conceivably close two sides and the fronts. 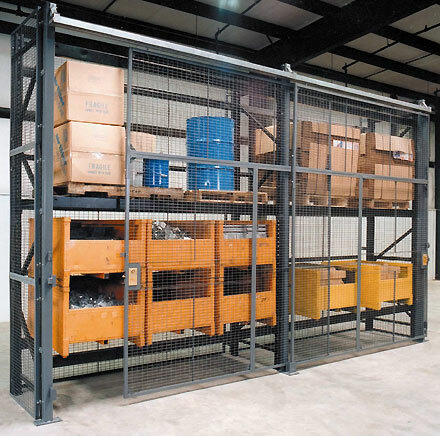 You can also cage off the back lower levels to create a single level of secure bays, while leaving forklifts able to load and unload the upper bays. The modular wire panels come in standard widths up to 10 feet, so you can selectively cage all or parts of a continuous row. Doors are sliding or bi-parting type, and you can load or unload with a forklift or by hand. Depths available to 4 feet and heights to 12 feet. We utilize WireCrafters for these systems. Visibility: the contents of your secure storage are apparent to anyone who walks by. No tops: If you cage a lower level, it’s possible for a thief to climb over and up. These cages typically don’t have tops. Accessibility: Any security system will inherently limit access. Your pickers and stockers will have to gain access to the rack by key or permission from management, and either slows the process. Rack type restrictions: These systems are designed for teardrop racks. If you are using another type, you can still utilize cages, but will need to order modified systems. Fire prevention: Sprinkler systems can reach inside these cages. These enclosures essentially transform your rack into a storage unit with solid sides and a rolling overhead “curtain” door. They are available in sizes from 8 to 12 feet high, with 42″ depths and widths from 5 to 12 feet. They’re very well suited to completely enclose and hide a rack bay from prying eyes and fingers. They also protect the stored contents from airborne dust and debris. Like the wire cage option, their hardware is difficult to tamper with and in many cases, inaccessible from the outside. They lock with a latch bar mechanism . A bit less versatility. You can order rack doors that slide or swing, but these doors must scroll up and down. This may make forklift loading & unloading more difficult, depending on the situation. However, you can get a little more granular with sizes on the low end. Aesthetics: Enclosures offer a ton of colors to match your needs. You could use the colors to code what’s inside each bay. Visibility: Contents are hidden, so plant visitors and others can’t tell what’s inside. Cost: they are more expensive than wire mesh alternatives.